US GDP growth for the third quarter was revised on the upside. Economic activity was up by 5% (annual rate). Compared to Q3 2013, GDP is up by 2.7% and carry over growth for 2014 at the end of the third quarter is 2.25%. 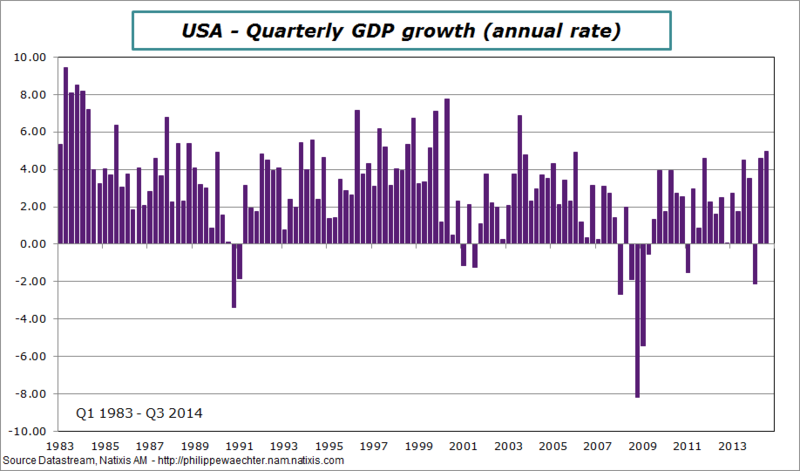 GDP growth number is the highest since the third quarter of 2003. There is confusion currently on markets and mainly on emerging markets. This implies sometime strong and brutal adjustments. Last night, such an adjustment has been seen in Russia when the central bank of Russia has increased its main interest rate from 10.5% to 17%. It was a response to the deep and dramatic drop of the ruble. The second TLTRO of the ECB, on December the 11th, has brought EUR 129.8bn of liquidity on the market. This will not be sufficient and the European monetary authorities will have to put in place new instruments, probably at the next ECB meeting on January the 22nd. 2 – In the ECB monetary policy framework, liquidity injections are temporary. It’s true for short-term operations but it is also what is seen for longer operations. Currently 2 operations that have been done, one at the end of 2011 and the other in February 2012 are reimbursed now. Their duration was 3 years. It’s an important difference with what is done by the Fed where long-term operations are purchases. Income distribution is currently a major topic as the crisis has persistent effects. We remember during fall of 2011 the “Occupy Wall Street” movement. More recently Thomas Piketty‘s book gave a framework to analyze and to understand deformations in income distribution. Piketty suggests that the economic dynamics doesn’t spontaneously converge to a fair situation and that corrective measures may be needed. Nevertheless we didn’t have an analysis linking income distribution and growth. What can we learn from the week of the 1st of December? The first point to mention is the long lasting divergence on economic outlook between the USA and the Euro Area.